Wonderful things are happening at Aphrodite this spring – Here’s some news! Spring has finally hatched and I guess it’s time to take down our fancy white Christmas tree from the window. But wait until you see what’s inside. Our little town of Antigonish is now known for having one of the ladies boutiques in Atlantic Canada! Inside the grand old house we occupy on Main Street you will find a great selection of everything from casual jeans to evening gowns. In between is great sportswear, snappy outfits for the office and gorgeous dresses to wear to special occasions like weddings – especially if you are the mother of the bride or groom! We have a great selection of all sizes and this spring you will find lots amazing European fashions in sizes up to 18. Simply said there’s just no place like Aphrodite if you want to look sensational this spring! Now here’s some news from the front lines….. I knew Sandwich was an important line for our Aphrodite clients when I first saw it. 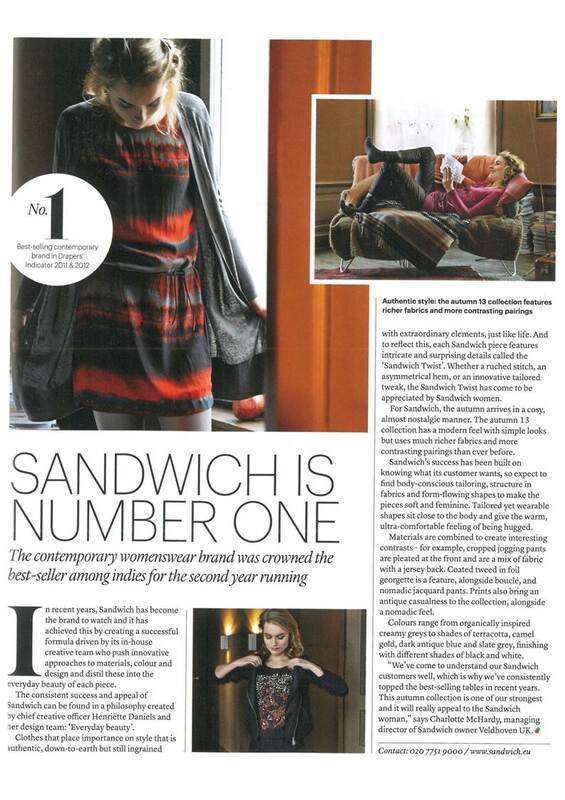 The Sandwich brand has been at the top of the charts in Europe for many years and now they are holding the number one spot in the UK.This is a page from Drapers magazine quoting Sandwich as the number one women’s brand. Three of our Aphrodite jewellers have been up to a lot of interesting things of late. In this post I’d like to tell you about Dorothee Rosen, Designer Goldsmith; Monica Graves – Glamjulz and Clare Bridge – each one very different in their design perspectives – but all gloriously wonderful creators. Dorothee operates her studio out of Halifax. 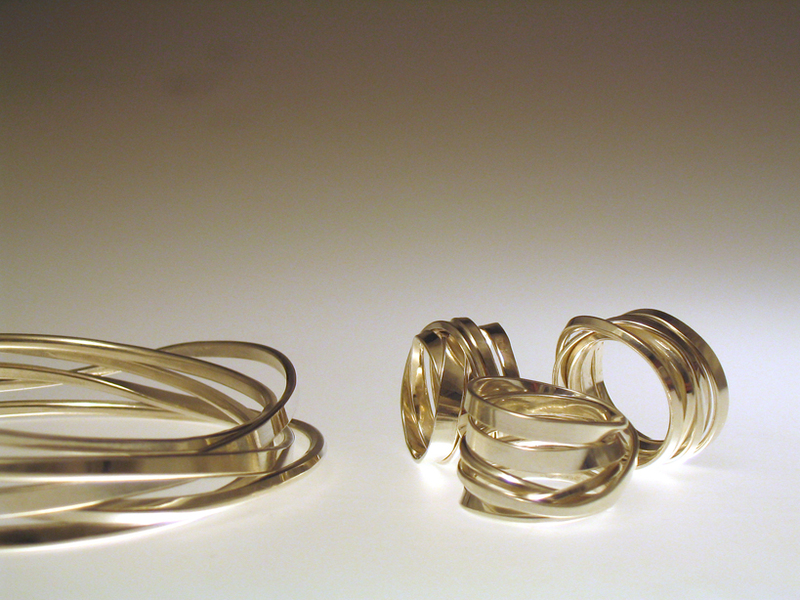 Our customers will recognize her iconic one to three footer rings in gold and silver and her one meter bangles. Here’s what the senior editor of the prestigious JCK trade magazine had to say about Dorothee’s work at the recent Philadelphia Buyers Market where Dorothee exhibited her work. By Jennifer Heebner, Senior Editor. Over the Feb. 16–18 weekend, I made it to the American Made Show, organized by the Buyers Market of American Craft, and globalDESIGN, a well-edited show of high-end designers run by the Jewelers Resource Bureau. Both shows ran in Philadelphia (my hometown), and between the two of them, they featured more than 300 jewelry designers. Lots of exhibitors at the American Made Show featured clever styles in silver, while nearly all vendors at globalDESIGN were high-end lines of karat gold and platinum. While I was wowed by many selections, here are five vendors whose works I particularly enjoyed. 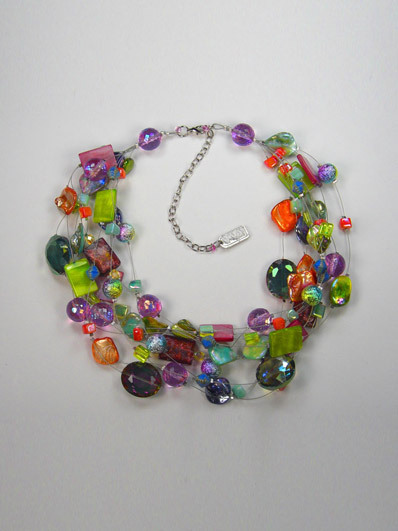 Monica makes bright colourful multi-strand necklaces that add more than a punch of colour to any outfit. It’s creative, happy and fun! Monica’s famous ten strand necklace. It comes in umpteen colours! Clare lives in nearby Tracadie where she creates stunning sculptural jewellery that is worn as statement pieces. Recently her work was accepted into the very prestigious Ganoskin Project. As the world’s largest jewelry related internet site, Ganoksin strives to develop exhibitions showcasing work from around the world. Participants are from The Netherlands, the USA, Canada, Australia, Costa Rica, the United Kingdom, Israel, Hong Kong, Colombia, Romania, Italy, Ireland, Japan, Malaysia and Denmark. Clare was chosen as one of the total 319 artists who contributed 729 show pieces for the permanent online exhibition. 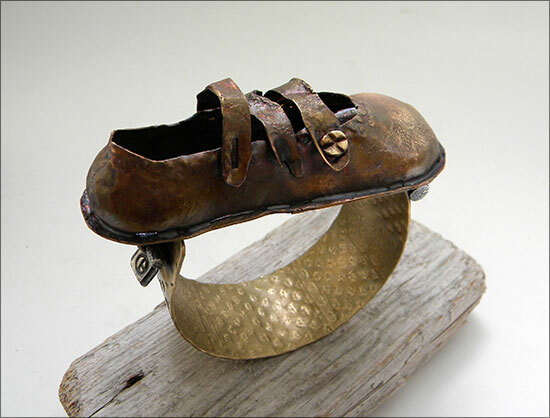 The piece that Clare entered is a a cuff featuring a bronzed child’s shoe that was found in the wreckage of the Titanic, This award winning piece has drawn international attention and acclaim for Clare and her exquisite work.